On the afternoon Thursday October 2 2014 Blyth’s inshore lifeboat was requested to assist the police in the search for missing person who it was believed could have entered the river Blyth. The lifeboat along with Blyth Coastguard Team, Police and a Police Helicopter searched the area for just over an hour. Thankfully the police were able to locate the person safe and well on land and the search was called off. One of the volunteer crew members on-board the lifeboat was Keith Packwood who is shortly to be leaving the north east but not the RNLI as he is transferring to volunteer on the River Thames at Chiswick lifeboat station. 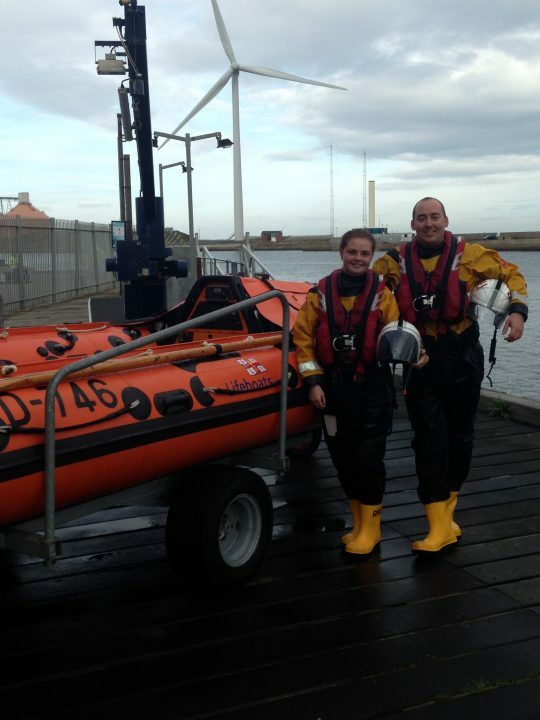 Blyth lifeboat station has also this week welcomed a new crew member, Chelsea Whyman, who took part in her first and Keith’s last, training exercise on the morning of Sunday October 5th. Shortly before they both took part in this training exercise Keith was also involved in launching the lifeboat to assist a broken down boat with two persons on-board near the mouth of the River Blyth. The boat which was just heading out for the day was towed back to its moorings further up the river Blyth. Blyth RNLI Lifeboat Operations Manager (LOM) John Scott said ‘Keith has been a valued member of the team here at Blyth and we wish him all the best at Chiswick and in the future‘. John also went on to say ‘It was also good to meet Chelsea for the first time, she will be our second female crew member here at Blyth’.